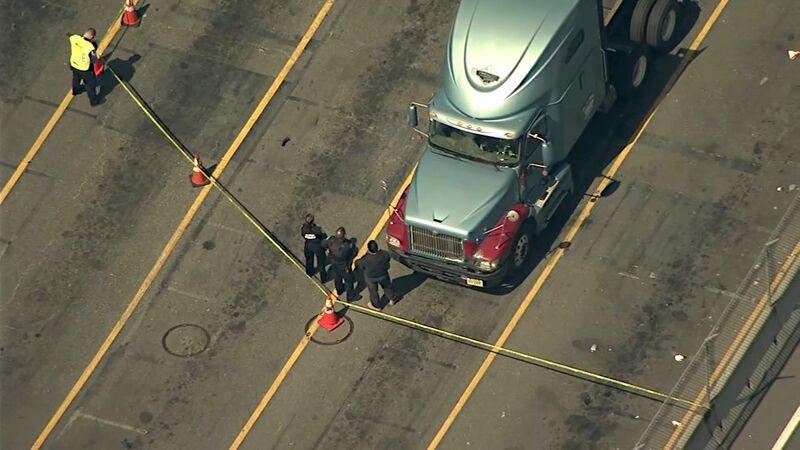 JERSEY CITY (WABC) -- Police say one person was killed and another injured after being hit by a tractor-trailer Thursday morning at a terminal in New Jersey. It happened at 10:30 a.m. at the Global Container Terminal in Jersey City. One person walking in the area was pronounced dead after being struck. The other was taken to Jersey City Medical Center with a rib fracture and pelvic injury, and was reported to be conscious and alert. The Port Authority Police Department is investigating the accident. The terminal is part of an industrial shipping complex along the Hudson River that borders Bayonne. The accident resulted in major backups for trucks going in and out of the facility. Global Terminal has suspended its incoming traffic for the day.